Rated PG-13 (138 min) This riveting true story of NASA’s mission to land a man on the moon focuses on Neil Armstrong and the years 1961–1969. 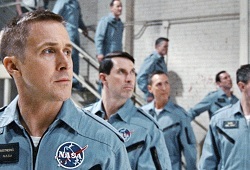 The film stars Ryan Gosling as Neil Armstrong, alongside Claire Foy, Corey Stoll, Kyle Chandler, Jason Clarke, Shea Whigham, and Jon Bernthal, and depicts the years leading up to the Apollo 11 mission. Directed by Damien Chazelle and written by Nicole Perlman and Josh Singer, based upon the book First Man: The Life of Neil A. Armstrong, by James R. Hansen.